Work in Progress: PM Suggestions/Additions to Koop. A.C. (AU) - See Age of Color. Age of Color(AU) - Pending Timeline changes. Air Bus - Standard issue airborne transport. Its design varies by Kingdom, but general use is a commercial and civilian transport capable carrying up to 20 passengers in relative comfort. Airship - Standard classification for large-scale air vehicles. These range from the enormous transport ships utilized by Atlas to the smaller ones that brought Ruby, Yang, and others to Beacon on their first day. Amity Coliseum - The four kingdoms worked together to construct an enormous floating arena to serve as host for the Vytal Festival Tournament. Amity Coliseum is capable of moving from one kingdom to the next, arriving at each destination when it is time for that kingdom to host the Vytal Festival. The arena features transforming terrain with a multitude of biomes to varied battle stages and can hold many thousands of spectators. Anima - The eastern continent of Remnant. Mistral is located here. The terrain varies widely from swamplands to wind-carved cliffs. Atlas(kingdom) - Atlas is one of the four kingdoms and is governed by a ruling council. However, the military has significant control over the council, and as such, they make many decisions. It is located on the northernmost continent of Solitas. Within its territory is Atlas Academy and City and Mantle. Of note, the Schnee Dust Company operates out of Atlas, and Dust mining operations are commonplace within the borders of Atlas. Atlas(city) - The city of Atlas came into being by being developed around Atlas Academy, until it was finally large enough to be considered a city. It grew so rapidly and so large that it became the capital city of the kingdom, and caused the kingdom to be renamed from Mantle to Atlas. Atlas Academy - The center of Atlas city and Kingdom. This academy trains huntsmen(taking the place of both Combat and Huntsmen Academies), in addition to training military troops. The surrounding areas also feature large R&D facilities that work in tandem with the Academy to develop new technologies and research in the unending battle against Grimm. It is also home to Atlas’s CCT Tower. Atlas Specialist - Hunters and huntresses who have joined the Atlesian Military after graduation from Atlas. They receive special military training in addition to their hunter training and are commonly sent out on missions of great importance. Atlesian - Of or from the Kingdom of Atlas. Atlesian Technology - Most highly advanced dust tech falls under the category of Atlesian tech in some regard. From guns to shielding to power supplies, Atlas produced an inordinate amount of dust applications, and while other tech producers exist elsewhere in the world, many have the roots of their technology in Atlas. Atlesian Airship - These are large, heavily armored and very slow airships capable of launching fighters and defending themselves with a huge battery of weapons. They are also capable of bombardment and scorched earth tactics, and can transport hundreds of troops with ground vehicles to accompany them. Atlesian Knight-200 - Robotic soldiers built by the Atlas military to replace live soldiers in combat and therefore save lives. Humanoid in appearance and armed with rifles and blades, their systems are linked to the Atlesian battle net and can be controlled remotely. They are capable of understanding spoken orders as well and serve as the primary infantry of Atlas's military. Atlesian Paladin-290 - Large-scale military mech warriors. Humanoid in shape and taller than a single story building. Heavily armored and heavily armed, Paladins feature a wide range of weaponry including pulse lasers and shotguns on each arm, missile batteries on the shoulders, and laser turrets with advanced targeting. It is agile enough to unleash melee attacks with its fists while maintaining relatively high speeds. Aura - Commonly referred to as the manifestation of the soul, Aura is a life force that flowers through all living creatures. It can be utilized, often with training, to produce protective effects such as a barrier to protect the body, and enhanced regeneration of wounds. Further training can allow users to manipulate the energy, gaining enhanced strength or even emitting blasts of pure force. Beacon Academy - Vale's Huntsmen Academy. The Academy is built around Vale’s CCT Tower and acts as protection for it. The school’s primary function is to train huntsmen, typically starting around age 17 or 18, for four years. Students are assigned to teams of four members and stay with them throughout their time at Beacon. Upon graduating, all students are granted a Huntsman License. Bullhead - A VTOL (Vertical Take-Off and Landing) aircraft, designed to transport troops(or students). It is also capable of transporting cargo or even ground vehicles underneath it using its powerful vertical lift capabilities. The Bullhead also has open sides, allowing troops to attack enemies from the vehicle, or allowing mounted weaponry to be equipped. Caster(AU) - Someone trained in using Dust in its raw form, without the aid of weaponry or technology. They can also augment their, or their allies, Semblance directly, without using a Semblance Catalyst Focus. Weiss and Glynda Goodwitch are two examples of this. CCT - See Cross Continental Transmit System. Combat Academy - Signal Academy and equivalent schools. Typically designed as a general education school that has additional classes to instruct on combat training, weaponry design and Grimm. These classes prepare students for the entrance exams to Huntsmen Academies. Cross Continental Transmit System - Technology developed by Atlas allowing for instantaneous communication between the four Kingdoms. There are four main towers, one at each kingdom's Huntsmen Academy. These four towers serve as the foundation for the system and are required for inter-kingdom communication. Smaller towers exist in less populated areas to extend the functionality of the system but often come under attack from Grimm and are therefore hard to maintain. Unlike the show, CCT Towers are capable of functioning without all four being online at once. Smaller towers still require their nearby main tower to be functioning. Dragon Isles(AU) - The name of the northwestern continent, named after its appearance of a dragon. The terrain is rocky and generally devoid of life, making it difficult to live there. As such, it is currently uninhabited. Dust - Dust is a material found within the world of Remnant. It is typically mined from the earth in a crystal form but can be refined into a powder and purified, increasing its potential energy and potential danger. Its properties as an energy source are not fully known, but it is used to power everything on Remnant. It is also referred to as the manifestation of nature's wrath, as it can be activated by Aura to produce powerful effects, ranging from lightning to fire blasts to freezing storms. As a weapon, it is most commonly used to augment weapon rounds to create things such as explosive bullets. Emerald Forest - A large forest northeast of Vale. It is commonly used by Beacon Academy as a training ground for hunters in training. Emerald Forest Ruins - Ruins of a civilization that inhabited the area now known as the emerald forest. The ruins are Victorian style and made of old, crumbling stone. Treasure seekers have looted much of the ruins but they become uncommon due to heightened amounts of Grimm within the ruins. Emblem - A symbolic object that is a distinct badge for a Kingdom, organization, family, etc. Since the creation of the Huntsmen Academies, hunters and huntresses often take on their own symbol, though family heraldry is still seen. Faunus - (Singular Faunus) are a race of intelligent humanoids that share Remnant with humans. They greatly resemble humans with the addition of animal traits, such as a tail or ears. Mammalian faunus are more common, but there is a very wide variety of types. Faunus have equal rights within each Kingdom, but are still regularly discriminated against, and are sometimes used as labor that is akin to slavery, especially in the Dust mining field. Faunus Rights Revolution - This war followed the Greyed War, instigated by the Faunus as retaliation against Humans for trying to place them all within the boundaries of Menagerie. The faunus were victorious in the war, and as such, they were allowed to live as equals within the four Kingdoms. Faunus War - See Faunus Rights Revolution. Forever Fall Forest - A forest located to the north of Vale and the west of the Emerald Forest. A mountain range separates the two forests. The forest gets its name from the season of fall, as the trees retain their red tone colors year long. Glamour - Dust can be applied cosmetically to clothing and equipment. This effect allows for a wide range of decorative effects such as sparkles or shininess, or what have you. Some Dust can provide non-combat based benefits such as the ability to exist more comfortably in high or low temperatures. Greyed War, The(Great War) - The Greyed War began 90 years ago, and lasted 10 years. It was a world war, with Mistral and Atlas fighting against Vale and Vacuo in an attempt to repress self-expression and art in order to control the amount of Grimm in the world. Vale and Vacuo won the war at great cost. The four Kingdoms signed the Vytal Treaty to end the war. As a celebration for the end of the war, the Vytal Festival takes place every two years since the end of the war. Additionally, the Tradition of Color Names lends it's origin to this war. Grimm - Grimm are soulless creatures of black flesh and white bone. They are characterized by masks of white bone and often take the shape of different animals and creatures of legend. The Grimm have hunted humans and faunus since the beginning of history, preying on the negative emotions of mankind. The Grimm vastly outnumber humans and faunus combined on the world of Remnant. While most are mindless and senselessly violent, stories tell of elder Grimm that have lived so long they've gained intelligence in their endless hunt of humanity. Huntress - See Huntsman, but with breasts. Huntsman - A profession that specializes in combating Grimm and in general, protecting others from Grimm, directly or indirectly. Huntsman Academy - Beacon Academy or an equivalent school. These are attended by huntsmen in training and require completion of an entrance exam that includes written, psychological, and live combat tests. Huntsmen License - A license earned from one of the Huntsmen Academies. The license allows a hunter or huntress to operate within the bounds of the law and accept jobs from hunter job boards. Infusion - Infusion is the act of placing Dust directly on one's body or clothing, for use as a weapon. This is an archaic form of Dust based weaponry, and incredibly dangerous. The advent of technology has created new, far safer ways to store and use Dust as an offensive weapon. Dust infused directly into the body or skin is known to spontaneously combust, especially under the strain of say, combat. Widely regarded as a terrible idea. Luna(AU) - The name of Remnant's moon. Has been shattered longer than anyone can remember, and therefore nobody knows the cause of it. Luna is not tidally locked with Remnant and as such, it can appear whole during certain phases. Magic - The term used to describe the abilities of the Four Maidens. Their abilities function through their Aura but are not connected to Dust or a distinct Semblance. As the existence of the Maidens is a well-kept secret, this term is sparsely used for its true meaning. Maidens - Legends tell of four maidens, each representing a season. They are said to possess extraordinary power that can be considered magic. The maidens pass their powers on from generation to generation, and as such, there is always four Maidens. Mantle - The previous name of the Kingdom of Atlas. Was renamed about 70 years ago after Atlas Academy became the centerpiece of everything within the Kingdom. Mantle is also a city to the southwest of Atlas city. Menagerie - The southeastern most continent. The continent is largely populated with faunus, as the land was "gifted" to the faunus race as recompense for the Greyed War, though they did not consider it a fair trade. The land is largely desert and inhospitable, and the deserts are home to particularly dangerous Grimm. There are multiple settlements along the western coastlines, and the White Fang is headquartered here. Also, it is Australia, but with Faunus. Mistrali - Of or from the Kingdom of Mistral. Mountain Glenn - A now abandoned wasteland that was once a Settlement of Vale. It is southeast of Vale and utilized an underground train to connect the two locations without fear of Grimm. Grimm eventually overran the settlement, and now it is swarming with them on the surface. The Undercity has abandoned mines and makes for a decent location to host a White Fang train party. Patch - A small island off the coast of Vale city. It is sparsely populated compared to Vale's capital city but does have Signal Combat Academy. Due to the low population, there are only a light amount of grimm present most of the time. Relay Tower - Smaller towers that expand the CCT Tower's area of influence. These towers work with the main towers to keep signals available throughout the kingdoms but often come under attack by Grimm, making it hard to defend all of them. 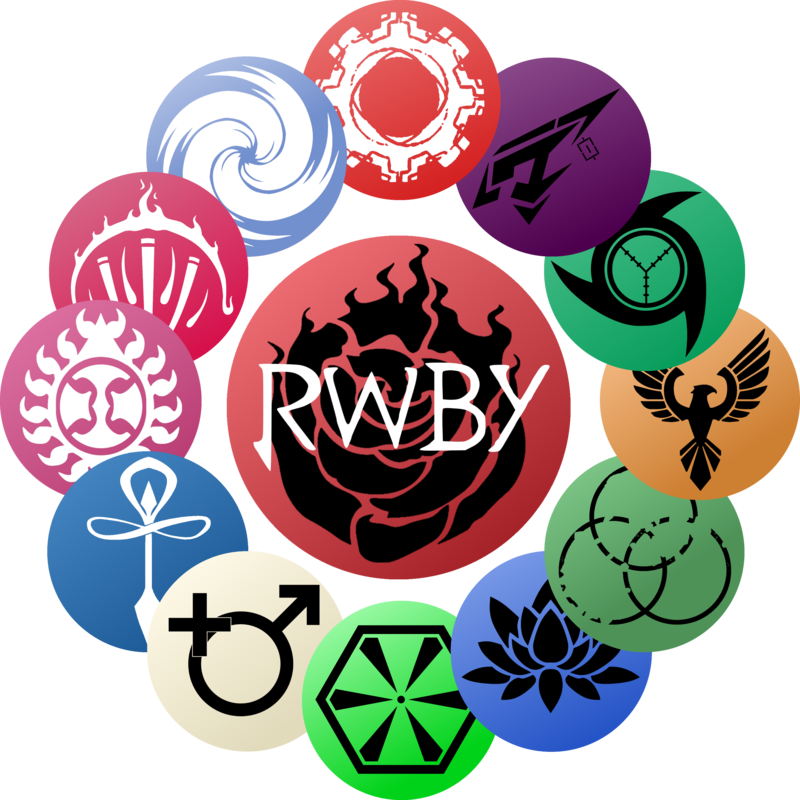 Remnant - The world of RWBY. It's a planet. Rocket Lockers - Featured at all Huntsmen Academies, Rocket Lockers are self-propelled lockers capable of being called to their owner over enormous distances. This allows huntsmen and students to summon their gear at a moment's notice, should they require resupplying in the field. Sanus - The largest continent, where both Vale and Vacuo Kingdoms reside. The terrain on the eastern side tends to be more mountainous or forests, while the western side is largely a desert. The center southern portion is a large Basin. The islands Patch and Vytal are considered part of the continent. Scroll - A collapsible, holographic tablet with very diverse functionality. Acts as a phone that can utilize the CCT System, can record and play video and other media, monitor Aura levels of the owner and teammates/allies, among many other things. SCF(AU) -See Semblance Catalyst Focus. Schnee Dust Company - The largest distributor of Dust in the world. It has its hands in nearly all Dust trade. The company has made an enemy of the White Fang for their unfair treatment of faunus workers. Claims say they used them as slave labor, and/or only using them in the most dangerous of jobs. The name of the Company was based on the original owners of the company, the Schnee family. Semblance - One's semblance is a manifestation of their personality and will in the same way Aura is a manifestation of their soul. It is powered by one's Aura and is usually a singular ability that reflects the character or personality of the character in some way. Semblances can be unique per person or be inherited from one's parents. They can be a very wide variety of abilities, such as enhanced speed, telekinesis, and damage absorption to name just a few. Semblance Catalyst Focus(AU) - A device that is attuned to a specific user and can augment their semblance by adding additional properties such as elements. For example, Blake used elemental fire, icy, and stone clones in place of her typical shadow clones. Foci commonly take the form of ammunition but can appear as a wide variety of trinkets, such as buttons on a shirt, a necklace, key chain, etc. Settlement - Referring to any town, city, village, or similar location that is outside of a Kingdom's primary capital city and surroundings. Specialist - See Atlas Specialist. Shifting Weaponry - Referring to the technology behind many Huntsmen weapons and their ability to change from one weapon type to another. For example, Pyrrha's weapon can rapidly transform between a sword, spear, and a rifle. Signal Academy - Vale's primary Combat School. The school teaches general classes to age 13-17ish students, along with a series of combat oriented classes that instruct the basics of combat, Grimm, and weaponry. Included in these classes is the forging of a personal weapon for every student. Solitas - The northernmost continent, housing the Kingdom of Atlas. Rocky cliffs and frozen wastelands make the land largely inhospitable to all creatures, including Grimm. The terrain also provides strong natural defense barriers against any Grimm that do make it up there. Large deposits of Dust are mined from the continent, supplying much of Remnant's Dust needs. Sunkist Sands, The(AU) - A large desert located on western Sanus. Once the site of the largest dust deposit known in the world, it is now overrun with Atlas mining operations, causing many oases to die. Vacuo resides within it. Symbol - Usually referring to a personal emblem. Also see Emblem. Teams - Refers to the teams of four that all Huntsman Academies utilize. Four students are placed on the same team for their stay at the academy, and teams often attend the same classes and go on the same missions together. Vacuan - Of or from the Kingdom of Vacuo. Vale(kingdom) - Vale is one of the four kingdoms and is governed by a ruling council. It is located in the northeastern part of Sanus, Remnant's largest continent. Within its territory is the City of Vale, Patch, Beacon Academy, and several Settlements along the coast. Vale(city) - The capital city of the Kingdom of Vale. Valish - Of or from the Kingdom of Vale. Vytal - A small island north of Vale. This is where the four kingdoms ended the Greyed War through the negotiation and signing of the Vytal Treaty. The Vytal Festival is named after this event. Vytal Festival - A biennial celebration of the end of the Greyed War. The most prominent feature is a combat tournament that takes place at Amity Coliseum. A Kingdom hosting the event rotates each time, and it includes parades, dances, and other festivities. Vytal Treaty - A treaty that was signed by all four Kingdoms, ending the Greyed War 80 years before the present. White Fang - Initially created as a symbol of peace, the White Fang has become a terrorist organization who threaten all governments and institutions throughout the world. They are based in Menagerie, where most Faunus go unaware of the happenings across the seas. They are responsible for many attacks but they are centralized around the Schnee Dust Company, its mining operations, and the distribution and use of Dust.